So, you’re looking for a new home. Square footage, neighborhoods, schools … there’s a lot to consider. And if you have pets, you don’t want to overlook their needs either. Don’t forget that they’re part of the family – it’s going to be their home too. You want them to be just as happy and comfortable as you, so remember that helping them acclimate to new surroundings means more than simply finding a good spot for the water dish or buying them a shiny new squeaky toy. Pets are affected by their environment as much as humans – some homes, and some neighborhoods, are better suited to their needs than others. As a prospective homebuyer with a pet, you can help your pets acclimate to their new home – without spending a small fortune – by observing some simple home-buying dos and don’ts. Think about layout and any physical features that could give your pet difficulty. If your dog is getting a bit older and lacks mobility, a home with lots of stairs to climb is probably going to be a challenge. If you have young pets, they may love to run around, so look for a playroom or open space that will allow them to stretch their legs and do some harmless rough housing. Cats love to hang out in window sills and watch the world go by. A home with windows close to floor level can be a safe and entertaining feature for your kitty. Of course, there’s always the litter box. Finding a private, out-of-the-way spot for this essential is ideal. You might also want to consider what, if any, renovations will need to be made. While we aren’t suggesting that you build your pet his own napping nook (but he certainly wouldn’t mind), you need to take a look at what areas may need to be changed and think of cost-effective ways of making updates. For example, will you need to install gates to keep your curious dog from wandering into an off-limits area? A baby gate is an inexpensive fix. Will the current flooring need to be replaced with something a little more scratch- and stain-resistant? Lay down large area rugs. Is the backyard already equipped with a fence? Adding a dog run that will contain your pooch outside is a cheap fix until you have the funds to put in a fence. All of these items can be purchased inexpensively from sites like Amazon and shipped to your new home. As a bonus, there are almost always promo codes and cash back opportunities. Accidents do happen. Pets sometimes slip past even the most vigilant and caring owner, so take note of whether a nearby busy street might pose a danger. Many pet owners look for properties with fencing but forget to check for holes and gaps that could give a curious animal an avenue of escape. Screens and gates should also be examined carefully for openings or weak spots. If they’re in need of repair, check out home improvement store websites for weekly deals on the supplies you’ll need, such as those for Lowes and Home Depot. Some neighborhoods are more pet-friendly than others. That can mean anything from a crotchety neighbor who doesn’t want his tulips trampled to an area that’s just plain dangerous. As you consider buying a new home, ask yourself whether you’d feel safe walking your dog in that neighborhood. Do you see people out walking their dogs? Is there a park or pet-friendly open area nearby? Ask your realtor to show you areas that are known for being pet-friendly. Many home buyers overlook rules and restrictions that govern whether they can bring a pet into a neighborhood or housing community. Pets, especially dogs and cats, are so commonplace that it’s easy to forget some homeowners associations don’t allow pets at all, or restrict them according to size and breed. Be sure to check city and county code restrictions that determine the kind or the number of pets allowed. If you own a dog, don’t forget that many communities have “noise pollution” laws that could make it difficult to let your dog sound off freely in the backyard. Check for animal waste receptacles, and find out about leash laws. Above all, read your HOA’s rules carefully, and bear in mind that many impose strict penalties for violating regulations. Don’t forget to consider your pet's needs too. You may like the area because it is close to shops and entertainment, but if the nearest dog park is 45 minutes away and the local vet has gotten less than rave reviews, you might want to reconsider. While the entire area may not be pet-friendly, there are signs you can look for such as pet shops, neighborhood parks, ample sidewalks, and pet waste stations that indicate the area does cater to pet lovers. Check to see if there are nearby Meetup groups so the two of you can socialize with other dog and cat lovers, make new friends, and get budget-friendly suggestions for pet-friendly fun in and around town. Your new home will be your pet’s home. It’s a place of refuge and comfort to them, just as it is to you. Moving can be a chaotic and traumatic experience; it’s a time of uncertainty and anxiety for everyone. It’s important to try to maintain your pet’s routines as much as possible. And remember that growing accustomed to a new environment can be a difficult adjustment for animals, particularly when their physical and emotional needs are left unmet. If he has trouble adjusting, consider rewarding him with a new toy or two, which he’ll soon associate with your new digs and find comfort in. Browse online to find coupons for your favorite pet stores so you can save a few bucks. 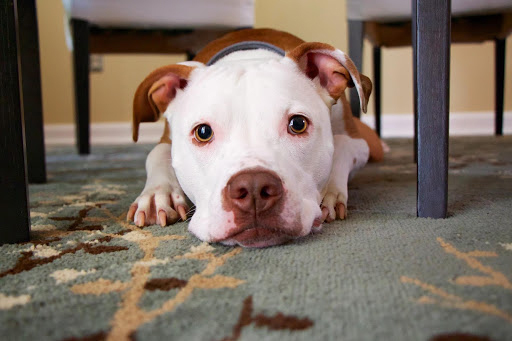 By keeping your pet’s needs in mind when you search for a new home, you’re paving the way for their comfort as well as your own, and it doesn’t have to be expensive to do so. Looking for a home that will meet their needs, checking for local laws and restrictions, and helping your pet adjust once you move will all help smooth the transition. Before you know it, you and your pet will be moving in, kicking back and enjoying your new space.